A 1788 bottle of Cognac has fetched the top price at an auction of wine from a Paris restaurant that boasts one of the world's most famous cellars. A French entrepreneur bought the bottle from the Tour D'Argent restaurant for 25,000 euros (£22,650), with the proceeds to go to charity. Some 18,000 bottles were sold for more than 1.5m euros at the auction - well above the expected takings of 1m euros. The restaurant says it hopes to renew the cellar's contents after the sale. Andre Terrail, who runs the restaurant - the third generation of his family to do so - said he hoped to add new wines from different parts of France, including the Loire Valley, to the cellar. "The past two days were very moving to me," he said in a statement at the end of the auction. "Every bottle sold in this sale will have to find the right moment and the right atmosphere to be appreciated to the fullest," he said. "Buyers acquired not only excellent wines, but also a large part of our history and soul." Wines from around France fetched well above their asking price. 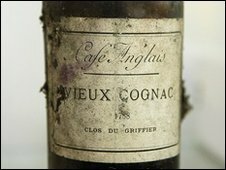 Two other bottles of the 1788 Cognac - from one year before the French Revolution - went for 21,066 euros and 18,588 euros. The restaurant, which was founded in 1582 and is on the left bank of the Seine, was popular with French royalty before it was stormed in the French Revolution. More recently it has attracted politicians and actors, though it has lost two of its three Michelin stars. It is famed for its signature dish of duck served in its own blood and for its views of Notre Dame cathedral. Its wine list is 400 pages long, with no fewer than 15,000 choices, and it still has at least 420,000 bottles left following the auction.